In October 2015, a corn germ oil processing line reconstruction project undertaken by Myande for COFCO Biochemical Energy (Gongzhuling) Co., Ltd was successfully completed. As a result of this reconstruction project, the capacity of the processing line has been increased from 150T/D to 280T/D, and the equipment stability and all technical parameters are improved greatly. In addition, the successful completion of this project has not only optimized the process technology and equipment and considerably reduced the running cost, but also enabled COFCO Biochemical Energy Co., Ltd to disuse and dismantle its existing processing line located at Huanglong, which has been a chronic headache because of its “high running costs, unstable product quality and potential hazards”. Previously, COFCO Biochemical Energy Co., Ltd ran four corn germ processing lines located at Gongzhuling, Zhonglongjiang, Yushu and Huanglong. The extraction workshops of the Gongzhuling, Zhonglongjiang, Yushu were built by Myande. In keeping with its commitment to produce high-end products, to develop its brands, and to further enhance its market competitive edge, COFCO Biochemical Energy Co., Ltd decided to integrate and optimize existing production lines. As the existing production line has security risks, old equipment and high production costs, it finally chose the design scheme of Myande by field trips, investment returns calculation and analysis and comparison: remove the old equipment, increase the capacity from 150 T/D to 280 T/D and optimize the pre-pressing technology. The scheme will not only provide COFCO with the same processing capacity as their previous two lines, but will also save more than RMB 10,000,000 if a new production line needs to be built. 1. Improve the raw material cleaning technology by adopting fully sealed compellable separation design and adding dust cleaning system to eliminate dust emission in the workshop. 2. Add cracking process to ensure desirable flak quality, which in turn improves pressing efficiency. The addition of the cracking process will also reduce meal oil residue of about 0.1%. 3. Improve flaking effects by replacing the old flakers with Myande new type flakers. The original flakers used in the workshop had created a lot of problem due to their precision, serious leakage, excessive vibration, noise and poor quality flakes. Myande flakers are well-known with low noise under 100 db and desirable uniform flake thickness at 0.35-0.4mm. The incorporation of PLC automatic control enables users of Myande flakers to reduce dependence on manual work. In combination with cracking process, Myande flakers enable reduction of meal oil content by 0.2%. 4. Change the cooking process by replacing the original plate dryer with Myande horizontal drum conditioner. The conditioner can reverse 360 degrees with cooking time being adjustable. The discharge temperature can be adjusted from 65℃ to 105℃. This will solve the previous problems such as poor cooking and heating effects, high energy consumption and dead points, at the same time, reduce the power consumption. 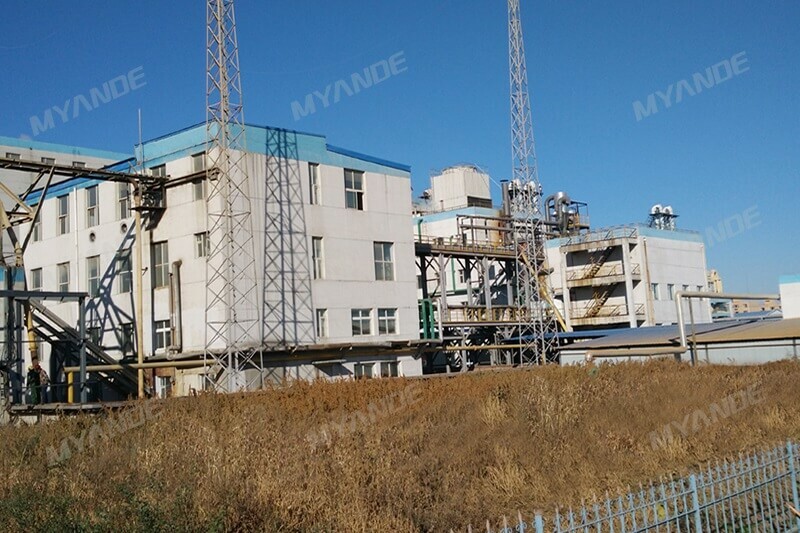 To meet the production requirements at the same time, Myande also optimized the extraction equipment: extended the length of the original extractor to increase extraction time, and optimized the spraying pipes, added the speed-regulating device; changed the replaced system; and updated the automatic control scheme. These optimization measures not only meet the requirements to increase production and improve the stability of equipment operation, but also improve the equipment quality and reduce the energy consumption significantly.